In 1968, Memphis sanitation workers, AFSCME Local 1733, went on strike for increased wages and union recognition, but most importantly, to be treated with respect and dignity. The strike became an important chapter in the civil rights movement, attracting the support of Martin Luther King, Jr., who was visiting the striking workers when he was assassinated. Photographer Richard L. Copley documented key moments during the strike, including marches, police and National Guard response, rallies, speeches, and memorials for King. 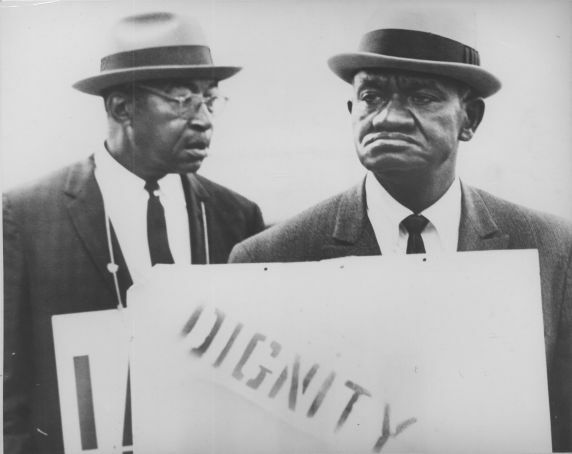 The Reuther Library is proud to partner with Wayne State’s Damon J. Keith Center for Civil Rights to present a selection of those photographs, on view through June at 471 W. Palmer, Detroit. More information on the 1968 Memphis sanitation workers’ strike is available in an online exhibit and through our collection materials. Also stay tuned to the Reuther blog for more this week!